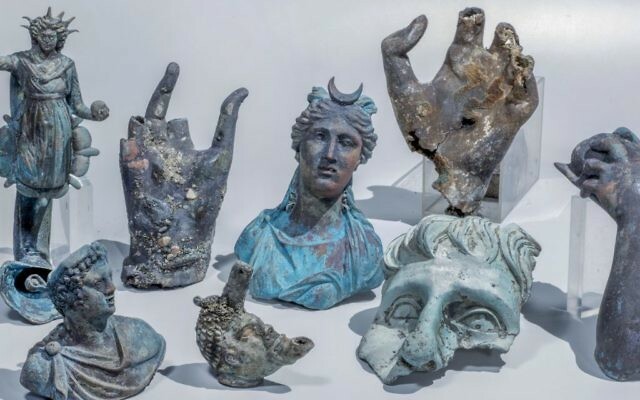 The Caesarea finds include well preserved bronze candles decorated with a likeness of the Roman Sun god Sol, a statue of the Moon goddess Luna, a candle in the form of an African slave's head and pieces of a vessel for carrying water. 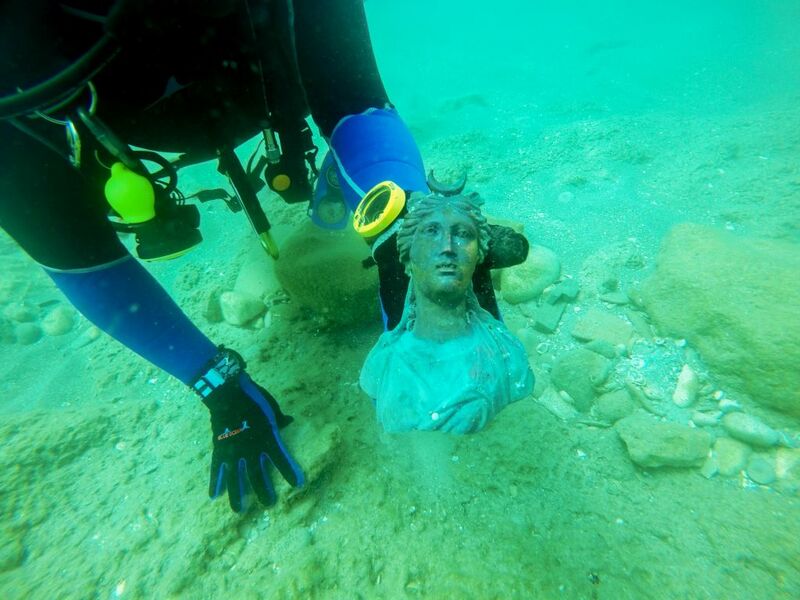 A priceless treasure trove of Roman artefacts have been discovered at the bottom of the sea off the Caesarean coast. The ancient items are estimated to be from 1,600 years ago, and made their way to the bottom of the sea when a merchant ship sunk during the Roman period. Two divers, Ran Feinstein and Ofer Ra’anan from Ra’anana, discovered the items by chance while diving. 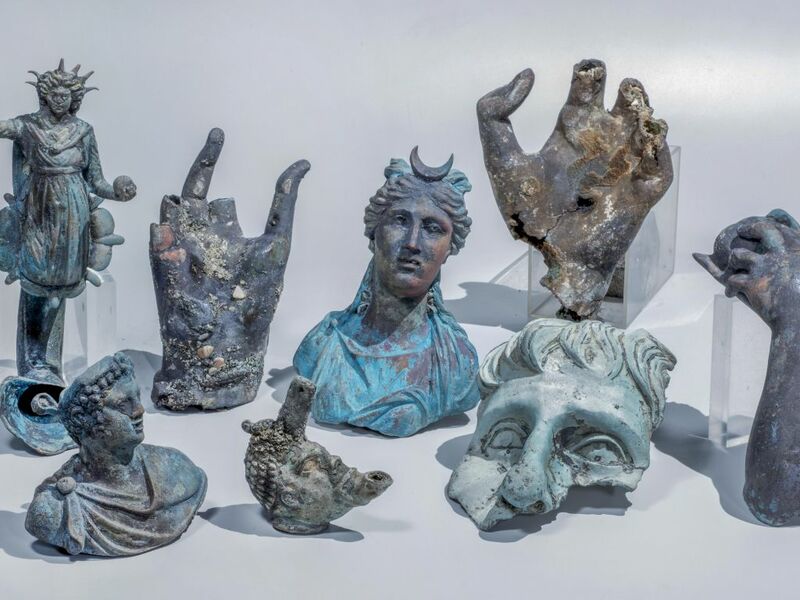 They informed the Israel Antiquities Authority, who found the remains of the ship buried beneath the sea floor, where items kept in the ship’s hold were well-preserved. The IAA has called the discovery the biggest treasure haul uncovered in at least 30 years. It includes well preserved bronze candles decorated with a likeness of the Roman Sun god Sol, a statue of the Moon goddess Luna, a candle in the form of an African slave’s head and pieces of a vessel for carrying water. The condition of the metal anchors found at the site of the discovery suggests that there was an attempt to deploy them in order to stop the ship from being dragged by the storm and hurled into the rocks, however the force of the waves broke the anchors. 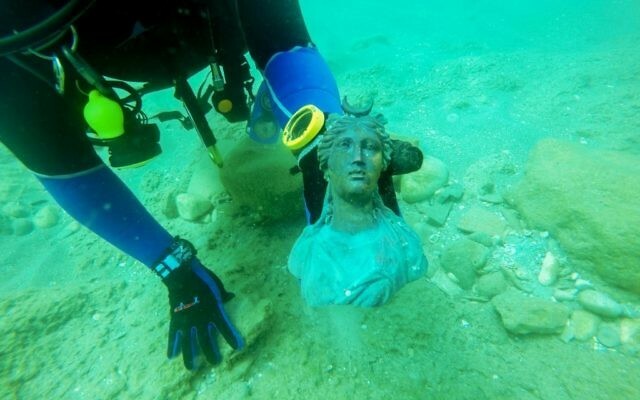 The sand which covered the bronze statues preserved them “as if they were created yesterday,” the archaeologists said. The coins discovered in the find bear the likeness of the Roman Emperor Constantine, who ruled over the Western Roman Empire (312-324 CE) and would later become Constantine the Great, the ruler of the Roman Empire (324-337 CE).